There’s definitely a traditional Taiwan feel to this place on Dongfeng street just off DunHua South Road. Worth a reservation if you’re going on the weekend with a big party of people. Vibrant table clothes, plenty of small plates drawing the eye, and some old-school decor running throughout the place. This place just makes me smile. Braised everything here: daikon radish, tofu, tofu skin, king oyster mushrooms, pig blood cake, seaweed, intestines, tendon, pig cheek. You know, the usual? The small plates vary in price. Safe bet – smaller plates start at $60, and the plates loaded with meat/fish are at most $120. All others are in the middle somewhere at around $80. Beautiful colours, I challenge you not to pick it up. This plate was cut up and ready to go when I was walking around. And, damn, how good does that look?! The lovely lady behind the counter got to work cutting our plate up on the board. Clearly, a specialist assigned to this section alone. We picked up a plate of the wood ear fungus (木耳) and dug right in. The name isn’t appealing, I get that, but don’t write it off based on that. The texture is interesting, the taste is fairly neutral, but the garlic and chilli really help the dish become more rounded. Nice to wet the appetite. Boom! Fill yer boots. They were all delicious, and I wouldn’t hesitate to order any again. I would perhaps add the sausage next time out of intrigue, too. Usually, when we see tofu skin 豆皮 (dòu pí) on the menu, we give it an order, but I haven’t had it cut this thin before. I think this is definitely the way to eat it. That daikon radish in there started life out with white flesh, but it has soaked in all of the flavours of the stock it has been cooked in and just bursts with flavour when you chow down on it. The intestines are delicious, but either a love-it-or-hate-it kind of thing. The pig blood cake is also along those lines. BUT, I would highly recommend trying both! Not for the faint-hearted: stinky tofu! 豆腐包 dòu fǔ bāo. A thin and crispy skin encases deliciously soft and creamy tofu inside. This was a triumph, in every sense of the stinkiest of tofu word. Perhaps my favourite dish was this one. Stir-fried vegetables with green onion pancake mixed in. 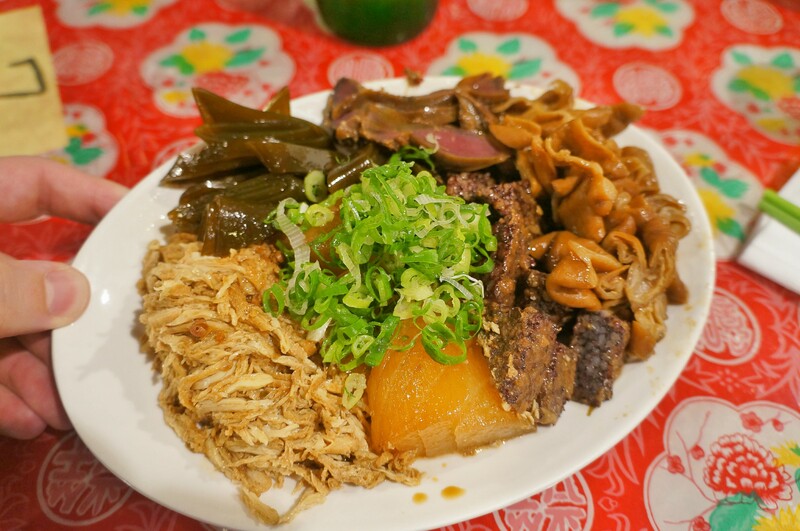 Originating from the earlier days of Taiwan, this dish was created to be tasty and filling for the workers. It really hits the spot! Whilst this was good, I don’t think I would order it again, as it is very filling. Strips of thinly cut tofu, stir-fried with onions and chilli. It was tasty but quite heavy. Drunken chicken – gotta love it. Soaked in 紹興酒 (fermented rice wine), goji berries and dates, this chicken is a solid order! There’s a deep wine flavour going on here with a sweet rice flavour lingering at the back somewhere, too. It is something really interesting and not something we get much of in the west. I’d definitely recommend this. We came here for a birthday celebration, so this monster needed to be ordered ahead of time. We didn’t figure it was going to be quite this big, though. Filled with tofu, shrimp, a massive fish head, napa cabbage and both meat and fish balls. The tofu was a filler, but the meat and fish balls were definitely noteworthy. The fishballs had a little sweetness to them, and the meatballs were mini versions of 獅子頭 and packed full of meat flavour. The shrimp tasted like they’d jumped right out of the water and straight into the pot, they were just that fresh. Look at that fish head lurking in there, though! It’s basically the size of the pot. If you can pick past the bones and the skin, the meat hiding underneath is more than worth it. It’s full of flavour, cooked perfectly, and oozing deliciousness throughout the soup base into the pot. Bottom line is that we ordered too much for 4 people. But, it allowed us to try a bit of almost everything on the menu. If I have to recommend you 3 things off the menu it would be the stinky tofu, braised food side plate, and the stir-fried veggies with green onion pancake. It’s pretty difficult to only pick a few, though, as I would order almost everything again (maybe not the stir-fried tofu, if I am being picky).